THERE’S ONLY ONE PLACE in the world which I know of where I can step into a phone booth and talk to god; climb the branches of a giant tree with illuminated LED leaves changing color to the tune of a live piano player below; or ride around in a camel with four wheels — and two humps filled with water for thirsty desert dwellers. 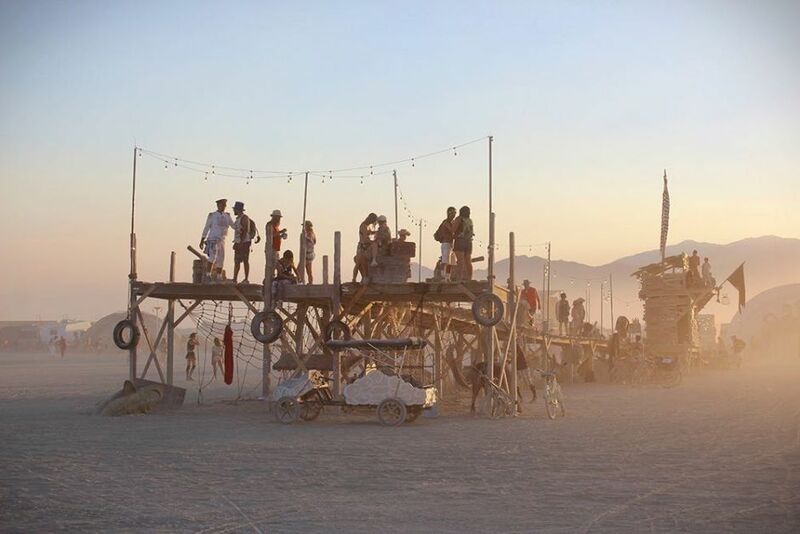 That place is Burning Man, the otherworldly, temporary city that emerges from the dusty Black Rock Desert in Nevada for just one week each year. 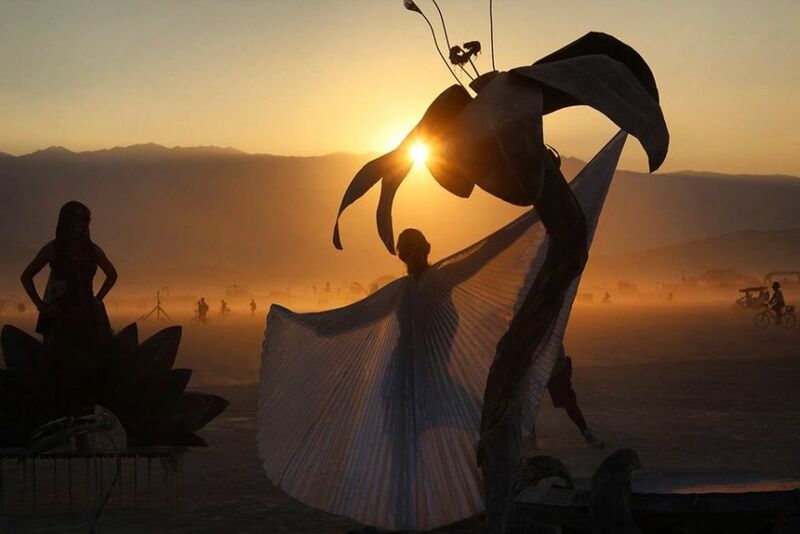 This was my seventh year attending and participating in Burning Man, and the experience was still revelatory, no matter how many times I’ve been. Whenever I set foot on that dusty, dried up lakebed, lovingly referred to as the Playa, I’m always filled with a flow of wonder, awe, disbelief, gratitude, and delight. 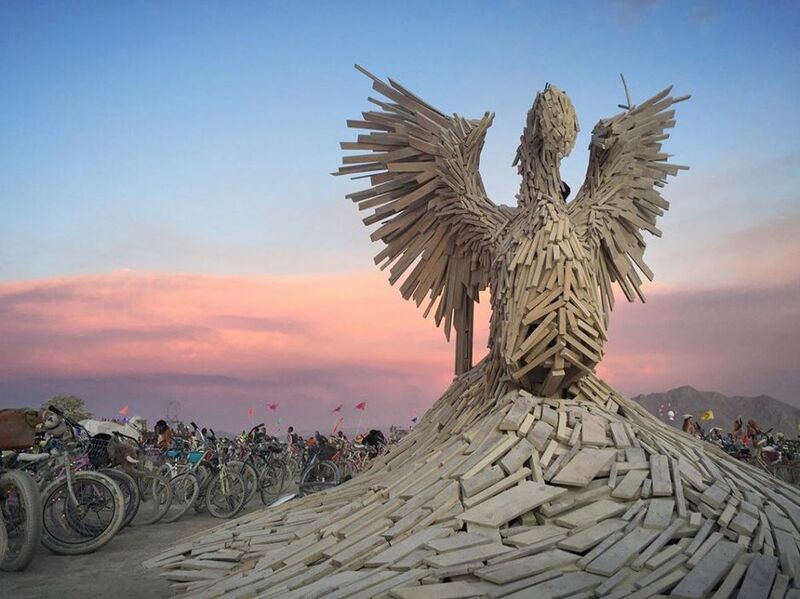 The creativity and community at Burning Man make me hopeful for this crazy world we live in, for if we can collectively build all this, then we can certainly make things better beyond the dust. Take a journey through some of the coolest scenes from this year’s Burning Man 2017, Radical Ritual. I love riding my bike around the Playa at golden hour. When a dust storm blows through as the sun is setting, it diffuses the light making for a magical, ethereal atmosphere. 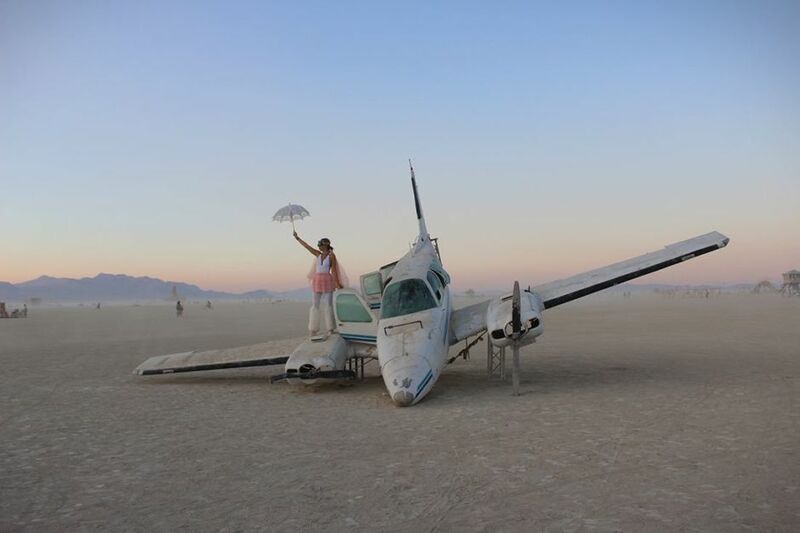 Burning Man occurs every year on a dried out alkaline lake bed in the Black Rock desert of Nevada. It's a beautifully barren, dusty landscape surrounded by mountains. Participants build large-scale artwork such as this dock. Just in case you’re wondering, there is no water beneath the dock. 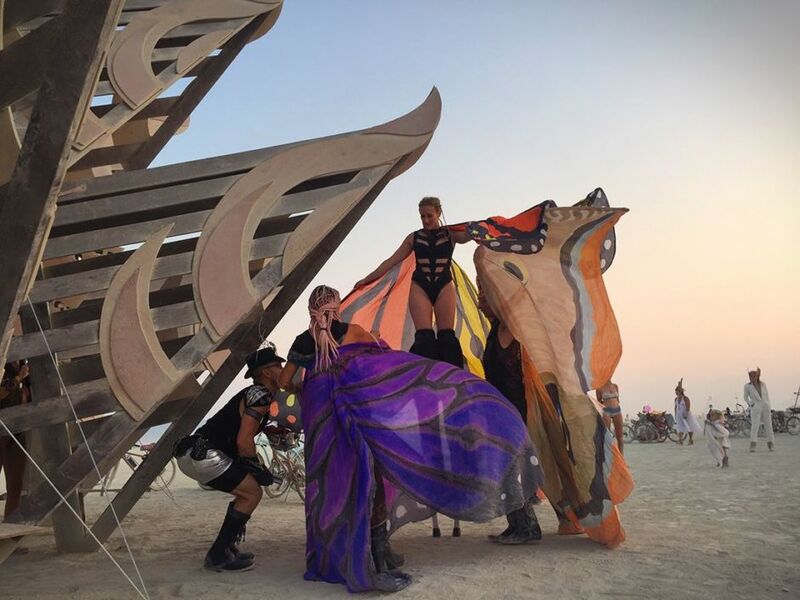 Taking flight at sunset in front of Efflorescence, a sculpture by Blazin’ Lily Gals. 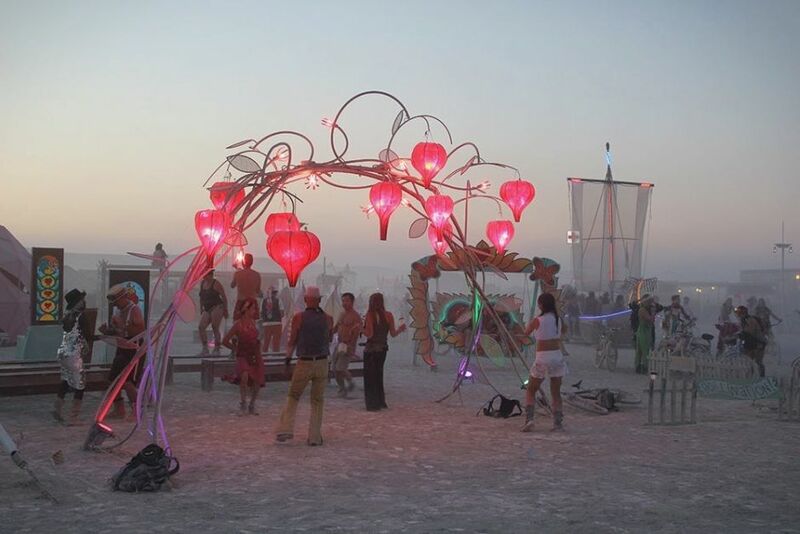 One of Burning Man's ten principles is Radical Self-Expression. Whether it's through costume, large scale art, or improvisational interactions, attendees creatively express themselves in many ways. 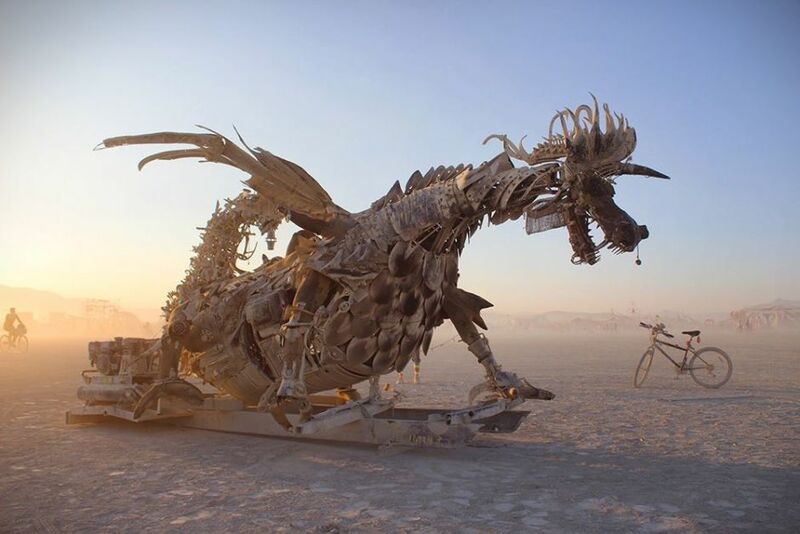 This large, metal dragon is just one of the dozens of impressive creations on the Playa brought by participants. 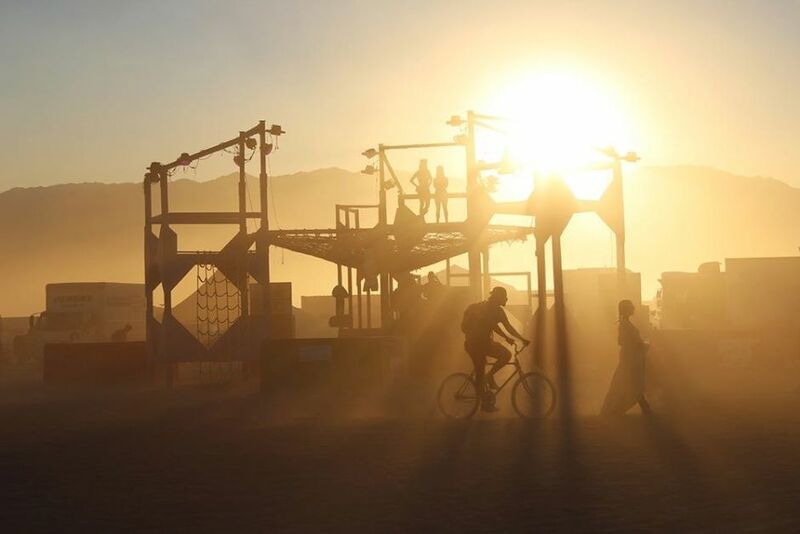 Black Rock City is an environment conducive to play, something from childhood which I think is easy to forget as we grow up. 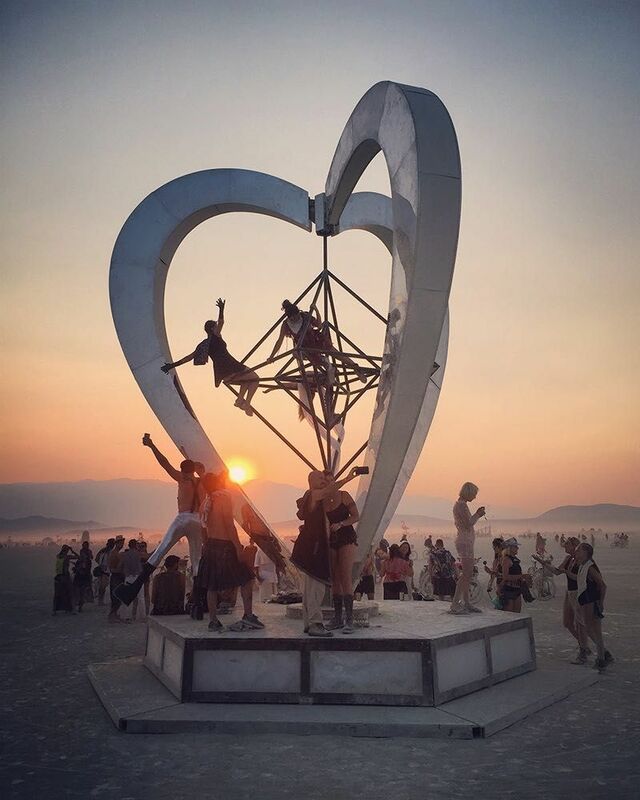 People cheered as the sun set behind the mountains and they spun around this giant heart. 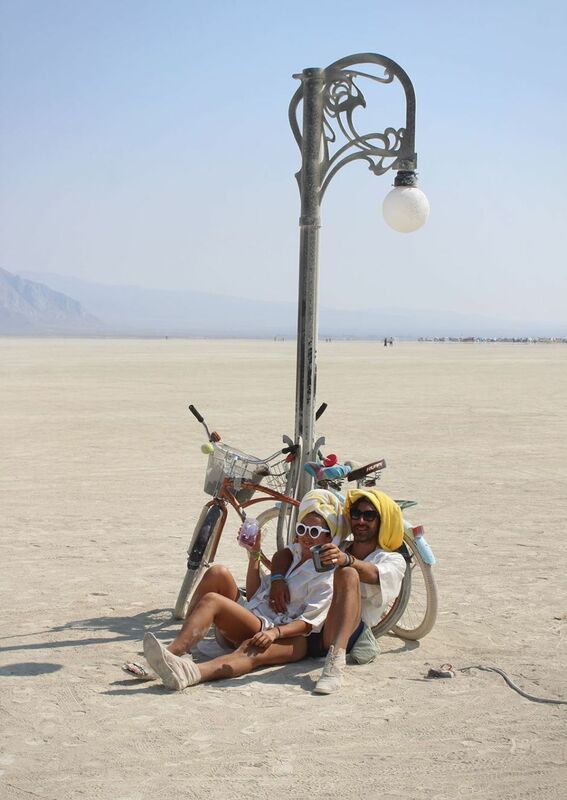 The best way to get around on the Playa is by bike, since Black Rock City is seven miles in size. Behind me and not pictured, live dancers and musicians play a classical music concert. People have parked their bikes around this Phoenix Rising sculpture in order to enjoy the show. As I was biking back to my camp to put on warmer clothes for the evening after sunset, I captured this man with rainbow wings walking through the dust. These three wooden totem sculptures, named Thunderbirds, by James Tyler, reminded me of something tribal. 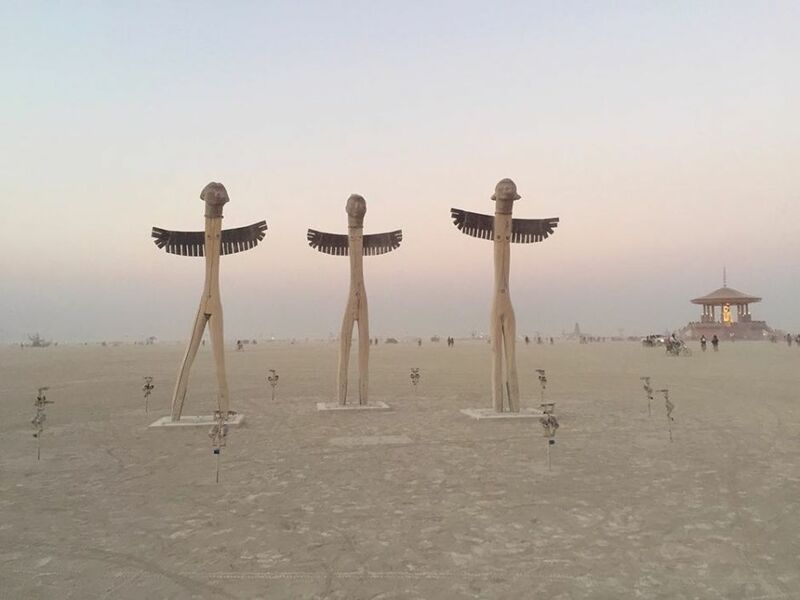 Each year Burning Man has a unique theme, and this year's was Radical Ritual. Much of the artwork subtly tied back to historical or ritualistic moments in human history. 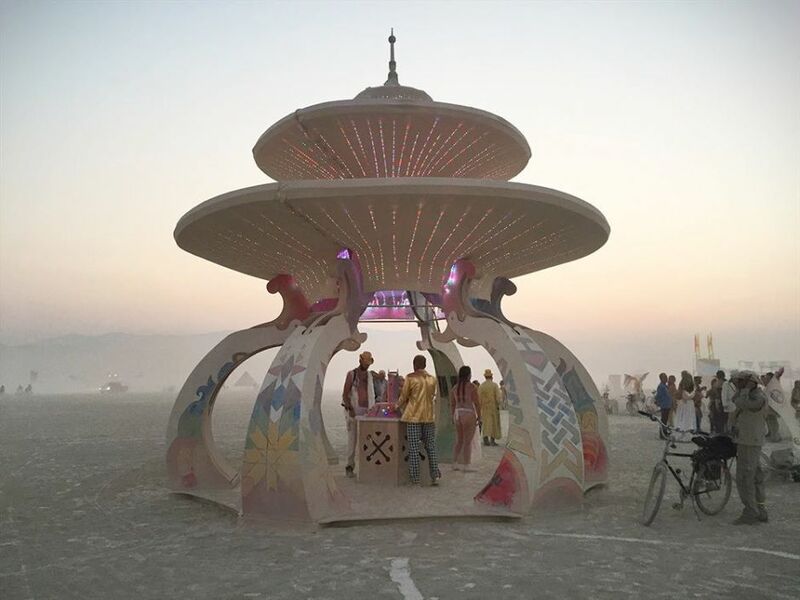 This illuminated temple structure called the House of Enlightenment was created by Douglas Ruuska. This wacky sculpture called Dance for the Dawn, by Karolis Misevicius & Lithuania Burners, looked like a giant eye from a distance. Up close, it became apparent that the iris was made of a bunch of hands. 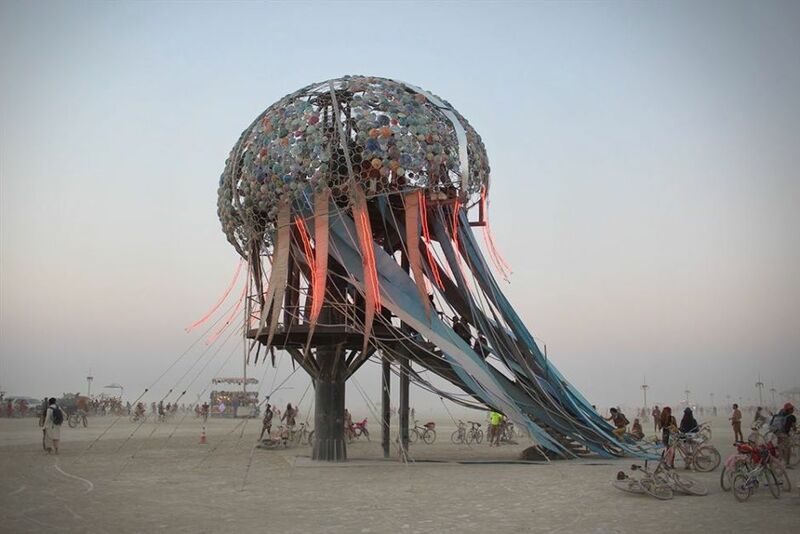 Bloom, a 40-foot-tall jellyfish sculpture by artist Peter Hazel sat in the middle of center camp. People could climb up inside for a view of the Man in the distance. 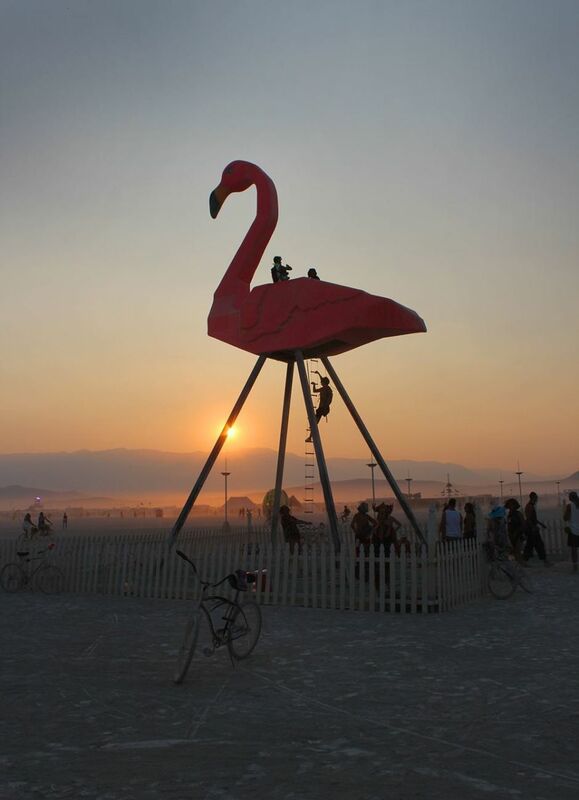 Who wouldn't want to climb a giant flamingo for a great view of Black Rock City? This sculpture, Phoenicopterus Rex, was created by Josh Zubkoff. People could crawl inside this metal sculpture and roll across the dust! It did take a bit of effort and muscle. The Dung Bug, was made by Brennan Steele & Friends. As I was biking back to camp at dusk after a long day exploring the artwork at Burning Man, I passed by this random dance party happening at a nearby theme camp. I love how spontaneous parties pop up all over the Playa. 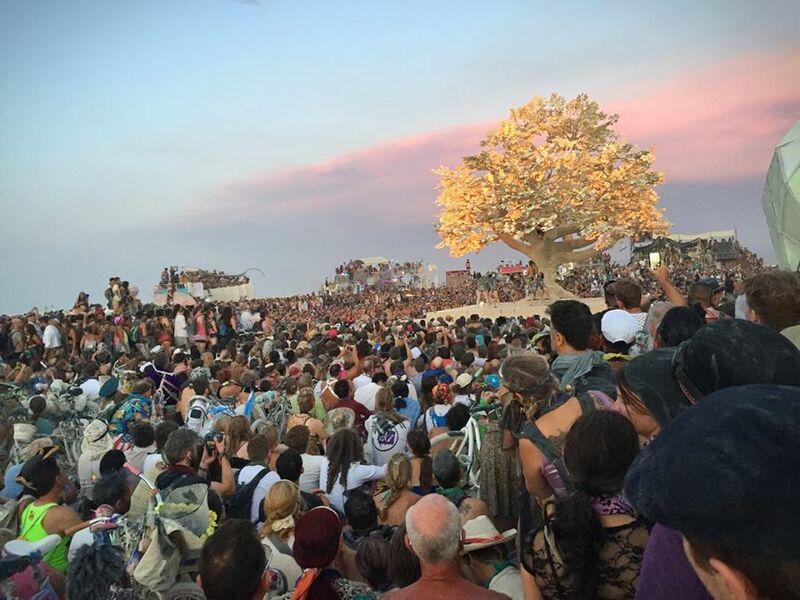 Onlookers gather around the Tree of Ténéré as dancers and musicians perform. This tree's LED illuminated leaves changed colors to the tune of the music. 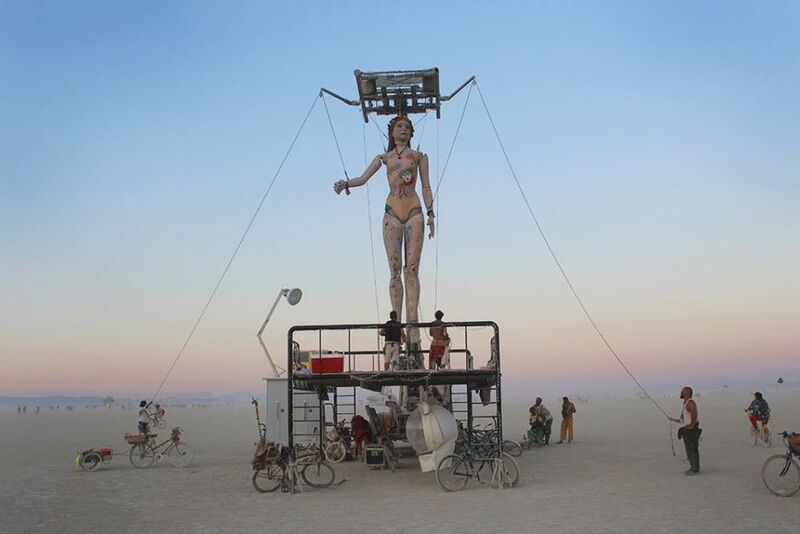 This giant marionette could be operated by five or six humans tugging at her strings. 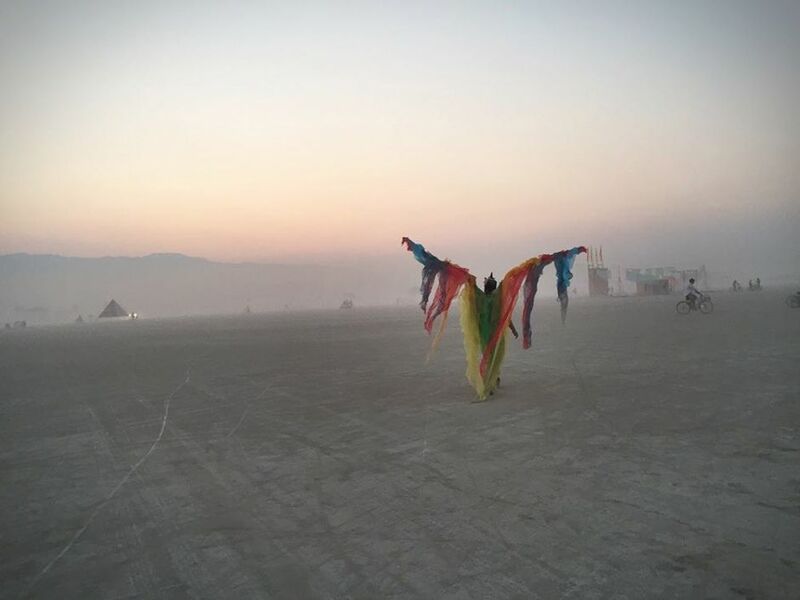 Throughout the week of Burning Man, her outfits evolved and changed, until the very last day when the Man burned, she was fully transformed into a "burner." This piece was called Step Forward, and created by Miguel Angel Martin Bordera. I was heading over to visit a friend's camp on the opposite side of the city, and happened upon this perfect moment when a woman was standing on this plane sculpture with an umbrella, seemingly ready to take flight. 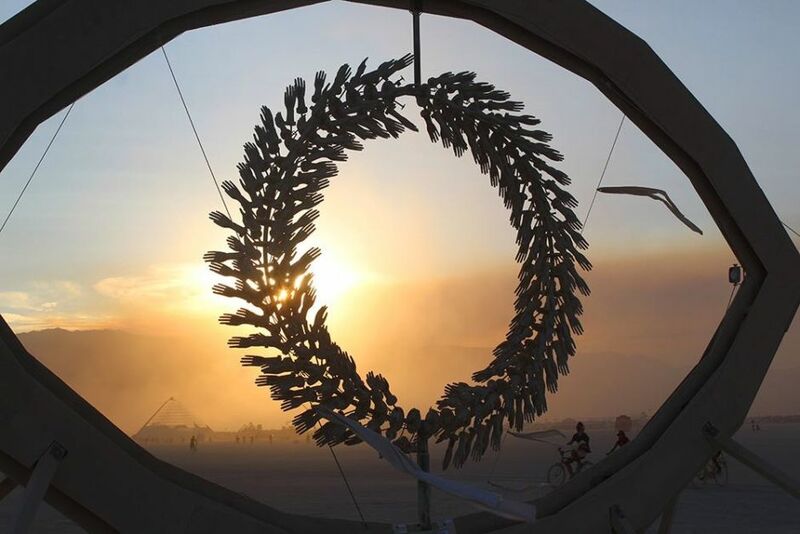 Black Rock City is a temporary place that is constructed on the dust for just one week a year. Much of the artwork participants create get burned at the end of the week. 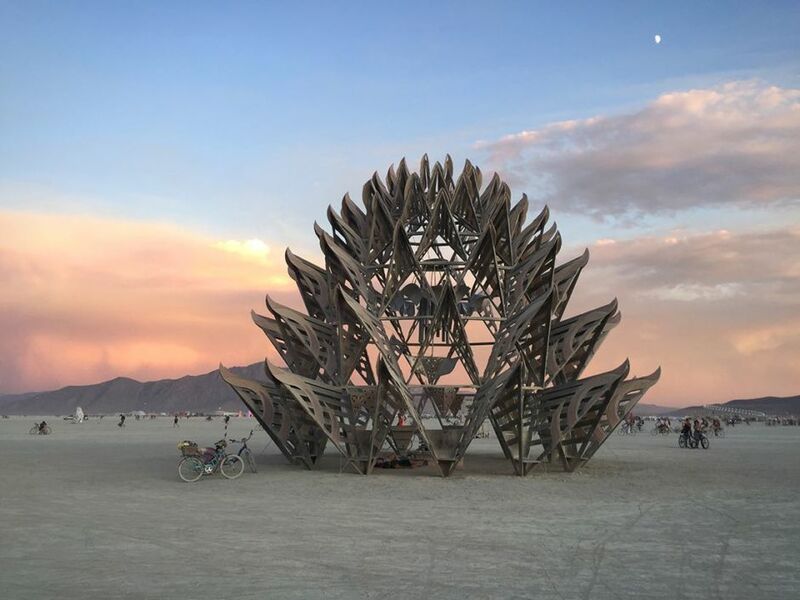 I was able to see this structure, the Temple of Awareness, by the Utah Builders Community, burn from a distance. It's quite a powerful experience to watch something so large burn, to feel the heat as well as the collective energy of surrounding onlookers. I stumbled upon these butterfly stilt walkers preparing for a wedding ceremony beneath the Temple of Awareness, one evening while exploring. 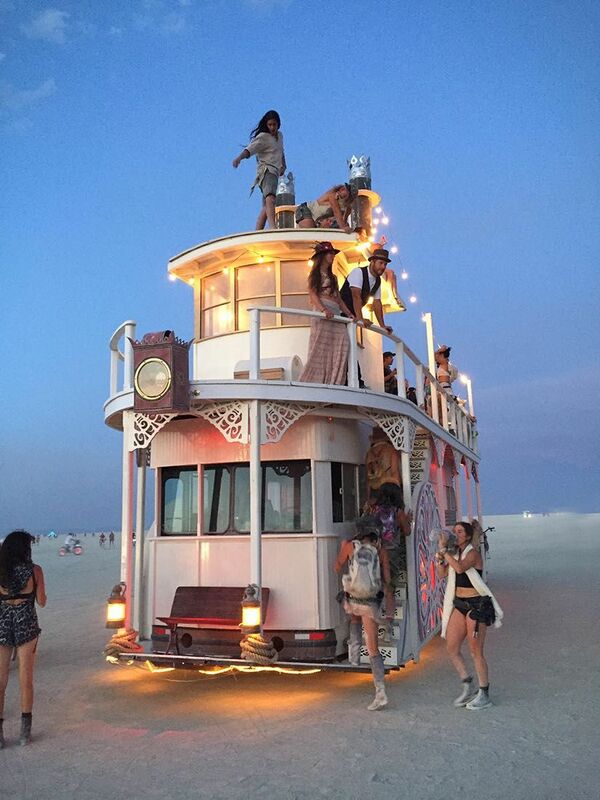 This steamboat art car captured my attention. 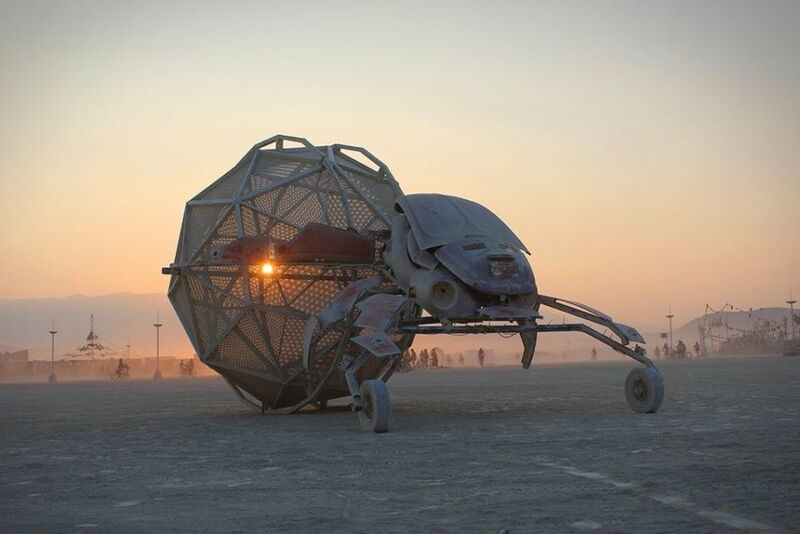 Art cars, or mutant vehicles, roam the Playa at five miles per hour. A couple sits beneath a street lamp in deep playa next to the La Victrola, a 35- foot sculpture of a gramophone. The design of the street lamps was very French art nouveaux.